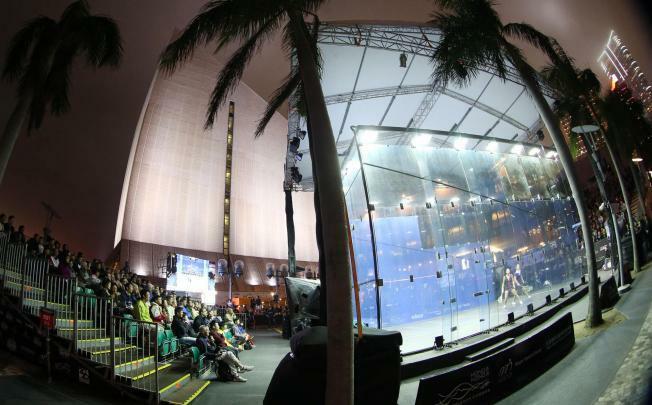 The men's semi-finals yesterday were moved from the outdoor court at the Cultural Centre piazza on the seafront at Tsim Sha Tsui to the Hong Kong Squash Centre because of the weather. But the rain cleared just in time for the finals, where David beat France's Camille Serme 11-9, 11-6, 8-11, 11-7 to underline her position as the world's best player. Set against against the spectacular backdrop of Victoria Harbour, David dominated her opponent on the unique all-glass show court which glowed in the dark in front of the inspectors Walter Sieber, a former vice-president of the Canadian Olympic Committee who was director general of sports at the 1976 Olympics in Montreal, and Hannah Burns, another Canadian who is now a senior manager at the IOC. "The fact that they have seen the quality of the game, the way Hong Kong organises this tournament, I hope we've impressed them," she said. David, who has been a passionate campaigner for squash's inclusion in the Olympics spoke to both Sieber and Burns. "It was nice to be introduced to [the inspectors]," said David. "They wanted to know more about the sport, even how I train and what my diet is. "Hopefully, I made a good impression." 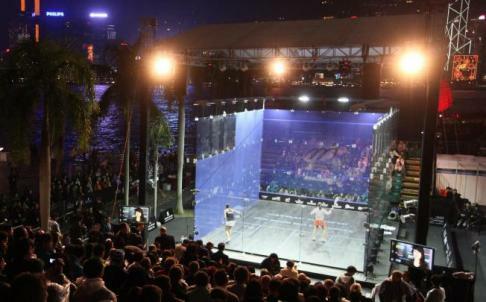 David is set to be one of the main presenters as squash continues to step up its bid for inclusion on the programme in 2020. "There are still two presentations before the final meeting [in Buenos Aires next September], one in May and the other one next month," she said. "If the World Squash Federation (WSF) needs my help to present the sport to the IOC, I would be honoured and always ready to assist them,"
The men's title was won by Egypt's Ramy Ashour, who beat England's world number one James Willstrop of England 11-8, 3-11, 11-7, 11-6. "Winning the Hong Kong Open twice is something I am really proud of," said Ashour, who regained the title he won in 2010, who is now targeting regaining his place at the top of the world rankings. Narayana Ramachandran, the President of the WSF, is confident that the IOC team left Hong Kong impressed. 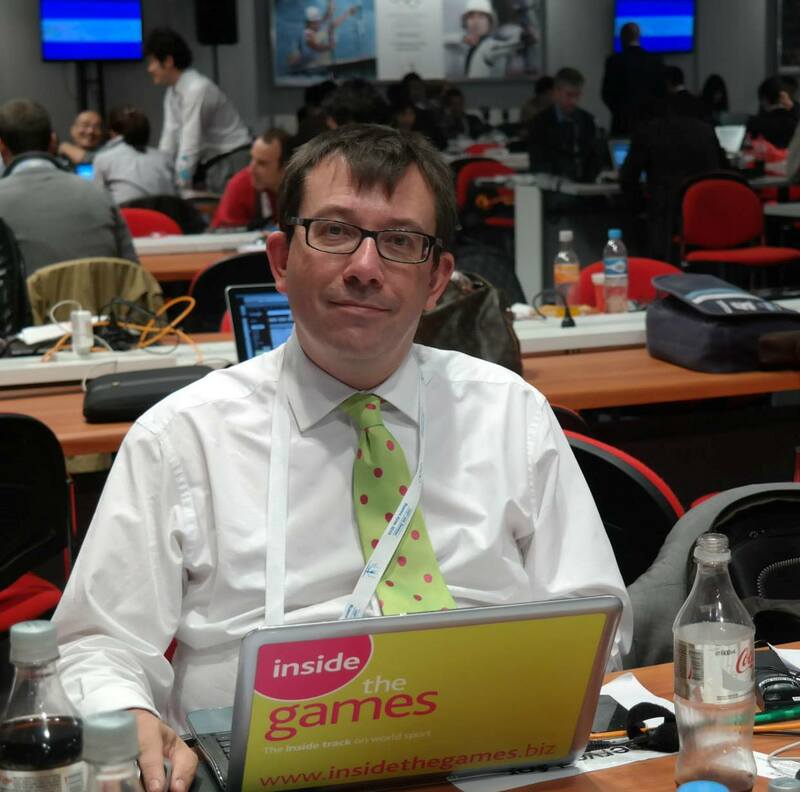 "When the IOC asked which tournament the commissioners should attend, we immediately said Hong Kong," he said. "We are really proud of this tournament. "It gets better every year."